Someone just asked me what's the point of shopping at H&M when I have access to amazing designer sample sales. The answer is - the H&M clearance racks. At the end of a season when they start slashing prices to next to nothing, I always stock up on dirt cheap basics and inexpensive collection pieces. When I saw this wool coat I knew it had to be better than half off. When the manager told me $15 I snapped it up. 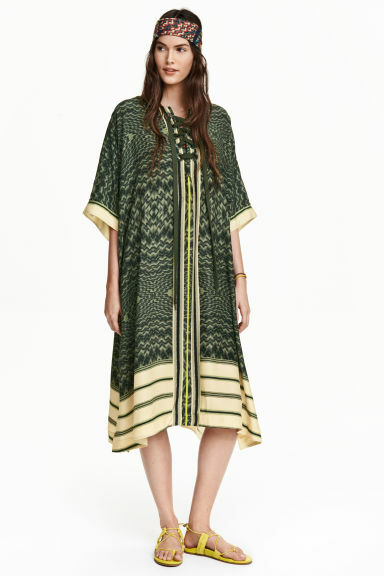 This H&M studio silk caftan is from their Spring/Summer 2016 collection and is sold out online. Retailed for $149, red sticker-ed $30! It's a size small and way too much fabric for me, but I love the idea of it. The problem could be that I'm not 6 feet tall like the model. We'll see. Grabbed a bunch of $3 workout wear (Retail $14.99-29.99) but most of it is for my SIL. Personally I work out in a sports bra and my husband's boxer briefs. Last but not least, my $5 lace skirt that retailed for $59.99. Pretty sure I missed out on the matching top too. For my Cali girls, I got a tip that the Morgane Le Fay sample sale will be on April 6-13th from 10-6, at 1109 Montana Ave, Santa Monica, CA. Prices will be up to 70% off so if you're a fan it's worth a look. Tomorrow (Friday) is the last day of the Vince Camuto and Cynthia Steffe sale. They usually mark down on the last day and a friend told me she saw stacks of DVF there! Mind you someone hoarded it but the good stuff always goes fast. Click here for details if you're gonna be in the City! I NEED ALL OF THIS, THANKS. Guess I know where I'm going this weekend. WOW! You totally rocked their clearance sale! I am loving their new Coachella stuff--not on sale, but whatevs! Thanks! Their Coachella stuff is pretty cute but I'm waiting to see it hit the clearance racks LOL. That gray coat is great! Oh my goodness, I wish the H&M's in New York City had clearance racks with items like those! Some of them do - every store varies so find a good store and stick with it LOL. I love a good bargain! I also like to score deals from clearance racks! It is more rewarding to shop that way!